I have a fever, I’m tired and come to think about it, I was scratched by a cat a few months ago. Could I have possibly picked up something from this cat? What am I talking about you may ask? Human Bartonellosis or Cat Scratch Fever. This is actually a disease of humans, not cats. Human doctors have been taught this is nothing to worry about, it will go away on its own. This is true in most cases but people that are immunosuppressed (have a weakened immune system) can develop a more serious form of the illness. Bartonella is the microorganism responsible for this disease, particularly B. henselae. 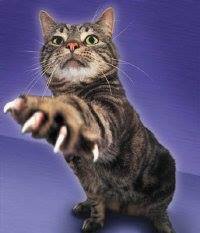 Cats are carriers of Bartonella, and there usually is a cat scratch involved, hence the name – Cat Scratch Fever. It is believed that about 40% of cats carry this particular bacterium at some point in their lives and kittens are more likely to spread this bacterium to people. It’s hard to tell which cats carry this because they show no signs of illness. The name is actually not accurate because some people with this infection have no history of contact with a cat, a cat scratch or bite! Guess what else can pass this on? I’ll give you hint – they bite too and they are annoying little pests. If you guessed a flea, you are right! The flea feeds off an infected cat, picks up the bacterium then feeds off another cat. The infected flea then leaves its excrement on the cat (flea dirt) and it’s the dirt that comes into contact with people and causes disease. There is no evidence as of yet stating that a person bitten by an infected flea will come down with Cat Scratch Fever. There is a blood test that your doctor can do to determine if this is causing your unwellness. There are 2 ways of minimizing your chances of coming down with Cat Sratch Fever: 1. keep your cat’s nails short and 2. consider year round flea prevention.